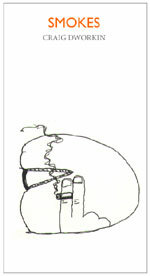 Dworkin's writing over the past decade has involved some of the most strenuous examples of "conceptual writing"—replacing the words of a nineteenth century treatise on diagramming sentences into its own antiquated grammatical terms, for example—as well as some of the more giddy soundscapes to come out of the practice of phonetic translations. A prolific essayist with an eye for paradox—his paragraphs can often turn on the misreading of a phrase that, in the end, turns out to be the only reading possible—it's fitting that, in Smokes, he turns his attention to the minimal concrete poem (in the manner of Aram Saroyan and Robert Grenier, for example), poems never reducible to single-line summations or dismissible as eye candy, but manage to tease with the perpetual promise of profundity looming in their translucent depths: "CLUE / that which holds / a tension." Smokes is infected with a comparable witty charm, augmented by the fact that they were originally published on cigarette papers, rolled and ready to inhale, taking the Sentences idea one step closer to immolation.